ePublishing Knowledge BaseePublishing Knowledge BaseePublishing Knowledge Base Creating, Managing, and Selling Products How do I change the “Thank You” messages that appear on my website's order confirmation page? 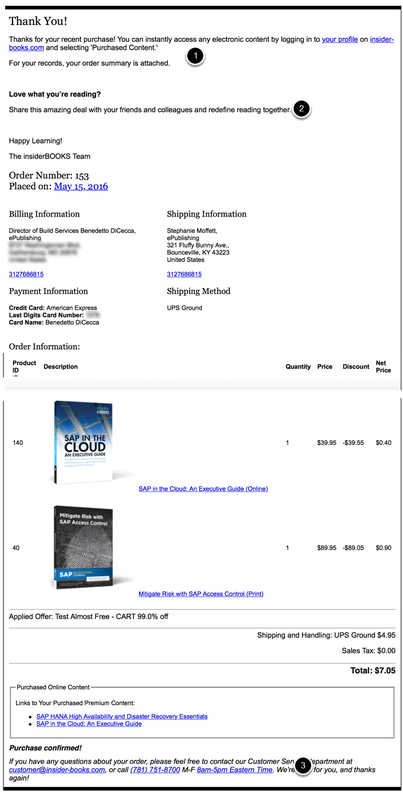 The thank you messages at the top and bottom of the order confirmation pages are customizable via the Editorial Content Manager. 1. Open the Editorial Content Manager. 2. Search for the word “order” in the Internal Name field to find the zones: "order.thank.you.msg" and "order.thank.you.msg.bottom." 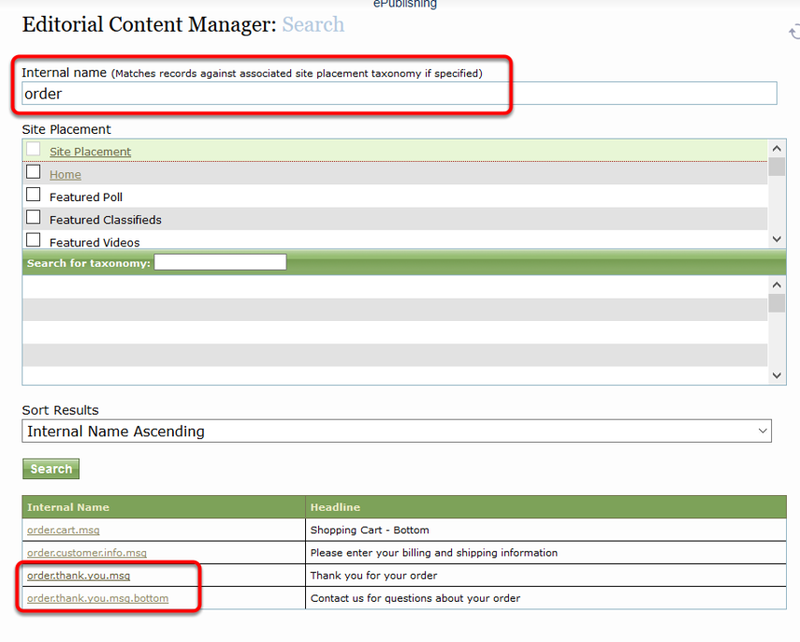 2.1. order.thank.you.msg controls the content on the top of your website’s order confirmation page. 2.2. order.thank.you.msg.bottom controls the content on the bottom of the website’s order confirmation page. 3. Click the name to edit. 4. Update the body text to change the content. Zoom: Update the body text to change the content. 4.1. Do NOT change the content in the Internal Name field. 5. Click Save to preserve any changes made. 6. To see your changes, return to your order confirmation page. You may need to test another store transaction to see the updated content. 7. Here's a sample order confirmation page with the various editorial content areas highlighted. 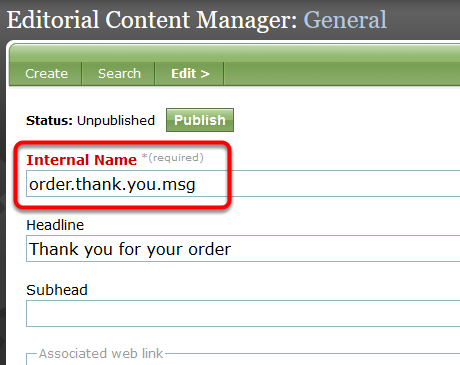 Update the editorial content area order.thank.you.msg to change this message. Individual product confirmation message - To update this, which appears on both your order confirmation page and your email confirmation: How do I customize the confirmation email message and online order receipt sent after my customer orders for a specific product? 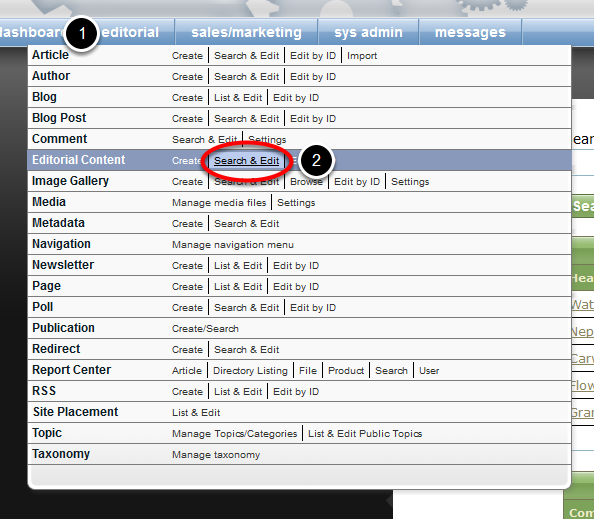 Update the editorial content area order.thank.you.msg.bottom to change this message. Prev: How do I manage store orders? Next: How do I use the price classifications when creating a product?